Meidensha Corporation (Meiden) and Fujitsu Limited (Fujitsu) announce deployment of an Internet of Things-based system developed by Fujitsu. The system will enable swift response in emergency situations, such as when a worker becomes ill or collapses due to heat at substations, water treatment plants and other key installation sites associated with Meiden’s businesses. The "Fujitsu IoT Solution Worker Safety"(1) was deployed in June 2017 at 10(2) of about 100 key installation sites across Japan where Meiden workers engage in various duties. As part of its efforts to bolster workers' safety and health, Meiden had been studying the development of a system that would enable the company to respond to such emergencies as the sudden collapse of workers on duty. In the Fujitsu system, each worker wears a vital sensing band(3) that calculates the level of heat stress(4) and physical burden(5) experienced by working in a hot, humid environment. These estimates give the site superintendent constant monitoring of the workers' physical condition, allowing for a swift response to any sudden deterioration in a worker's condition. The system will also enable the company's management to comprehensively understand the working environment in Meiden's installation sites, helping managers to consider effective measures to make workplaces safer. Meiden and Fujitsu plan to utilize data they have gathered since the system's introduction for comparing and analyzing the periods when workers have high or low levels of heat stress. While the number of industrial accidents in Japan has been decreasing over the long term, greater efforts are needed to bring this figure down further. In 2016, about 1,000 workers died and approximately 120,000 others were injured in industrial accidents in Japan(6) . Meiden has introduced the "IoT Solution Worker Safety" at its installation sites to improve its accident prevention measures. The vital sensing band gathers data about the temperature and humidity of the working environment as well as the wearer's pulse(7) , which will be analyzed with sensor algorithms to estimate heat stress and the physical burden imposed on the worker. If these estimates reach pre-set levels requiring a response, the device will notify the workplace superintendent, who will contact the worker by phone to confirm the person's condition, or to provide instruction to take a rest. This enables the superintendent to remotely and simultaneously monitor the condition of several workers at the workplace. Management, meanwhile, will be able to consider mid- and long-term measures to make the working environment more worker-friendly by comprehensively examining the conditions in which workers carry out their duties based on data accumulated by the system. "Fujitsu Cloud Service K5" are trademarks of Fujitsu. 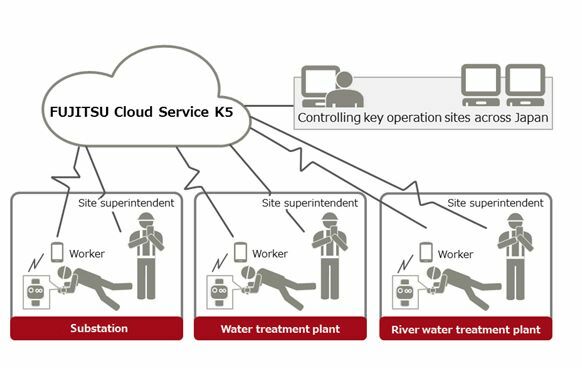 The "Fujitsu IoT Solution Worker Safety" - The "Fujitsu IoT Solution Worker Safety" is designed to help construction and manufacturing companies to remotely monitor employees as they work, reducing safety concerns. The 10 installation sites - The 10 installation sites are in Tokyo as well as Hokkaido, Miyagi, Saitama, Chiba, Kanagawa, Yamanashi, Aichi, Hyogo and Fukuoka prefectures. A vital sensing band - A vital sensing band is not a medical diagnosis device. It sends an alarm when the gathered data in addition to estimated heat stress and physical burden reach a pre-set level requiring a response. The level of heat stress - The system's estimates are made in four categories: "Safe," "Low heat stress level," "Medium heat stress level" and "High heat stress level." The estimation of a worker's heat stress level is made by collecting data on the temperature and humidity of the worksite as well as the worker's pulse and activity volume and analyzing them based on the Japan Society of Biometeorology's study on Wet Bulb Globe Temperature (WBGT), a composite measure used to estimate the effect of temperature and humidity on humans. Physical burden - Physical burden is estimated on five levels: "Generally safe," "Caution," "Concerning," "Very concerning" and "Danger." Estimates are made from the worker's pulse, which is analyzed using such indexes as the Karvonen Formula. The wearer’s pulse - Pulse counts per minute are estimated. Meiden is the leading infrastructure-building company - power, rail, water and people's mobility. It offers a wide spectrum of products and services in the fields of power, T&D, water processing, etc. Drawing on our engineers resources, Meiden seeks to improve the connectivity of society and to enable our people live better. Meidensha Corporation (TSE:6508) reported consolidated revenue of 220 billion yen for the fiscal year ended March 31, 2017.